The Vincent firm is remembered above all for its fantastic l000cc V-twins. In the 1960s. and long after its makers had ceased production, the l000cc remained the fastest standard machine in the world. But Vincent also made a 500cc bike, the Comet, which was virtually identical to the 1000. The Grey Flash, was only built in very small numbers from 1950-51. The mechanical components were based on the Comet and its color was the sole external distinguishing feature. But the Grey Flash was destined exclusively for racing. 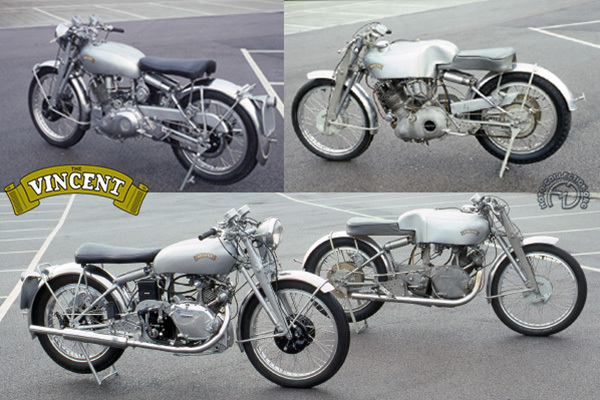 Like all the Vincent C series range, the Grey Flash was fined with a Girdraulic front fork. This was a girder fork that combined springs and hydraulic damper, cast in aluminum. Moreover, the cantilever rear suspension acted on two spring-damper units running beneath the saddle. Since the engine was a structural member, the Vincent C Series had no conventional frame; its spine also acted as an oil tank. The 1000 Black Lightning and 500 Grey Flash production racers had many modifications, like triple valve springs and polished and lightened connecting rods. Prepared for racing, the Grey Flash weighed just 330 lb . But it arrived too late to make much impression on the international racing scene in the face of the new Featherbed Norton Manx. However, it had many wins in national races, ridden among others by Vincent apprentice John Surtees. Meeting of two rarities- two Grey flash Vincents, a ''long tank"racing model and the unique road going version.